Summer is finally upon us and I don’t know about you but my wardrobe is in need of a serious revamp. Joe Browns is a brand that creates a unique range of clothing items that are different from the items you find on the high street. Their BIG Summer Sale has just launched and I thought of sharing a few of my favourite picks from the sale and items YOU NEED in your wardrobe this summer. I have been on the hunt for a pair of printed trousers for a few months now and the hunt has officially ended today. These trousers are perfect, the colour is bright which is perfect for the summer and the pattern on the trousers is also very simple which makes me feel more comfortable to wear them. As soon as I saw this top my first thought was summer. Lace and daisies are the perfect combination for the summer time, and this vest top is great to wear with the trousers I mentioned above, jeans as well as a skirt. It can also be dressed up and down to suit you. This is one of those dresses that you can just throw on with a pair of sandals and your good to go. Perfect for those lazy days at home as well as for the days you go to the beach and want to just relax. Isn’t this just the sweetest thing ever? It’s a swimsuit but with a skirt at the bottom giving you another layer and in my opinion make you feel more comfortable wearing a swimsuit. The print is also really pretty. I live in England after all and summer isn’t summer without the rain, but instead of a coat something much lighter yet protective is the best option. This floral mac is absolutely stunning and I would wear it even if it wasn’t raining because I love the print. No Wishlist is complete without a pair of amazing shoes! This pair is quirky and fun, and very not me but this summer I want to take more risks and wear things which are bright and stand out similar to the trousers. The heel also isn't that big, making it wearable for everyone. 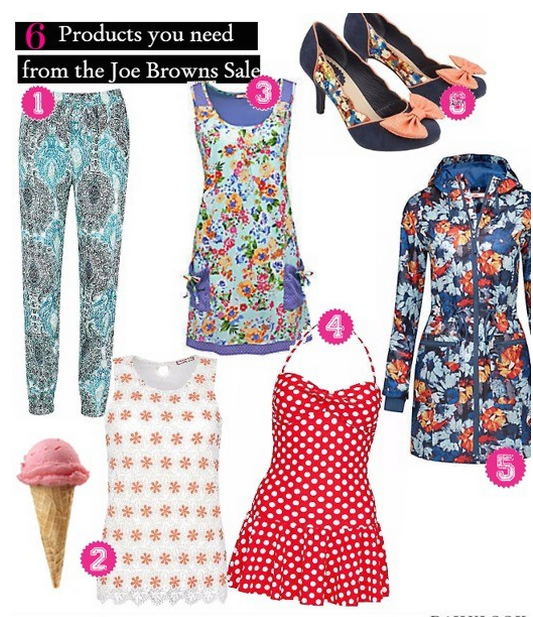 There you have it, my top picks from the Joe Browns Summer Sale! Is there anything that you have got your eye one?